The historic seaside Village of Cowichan Bay is located about 55 kms north of Victoria and 64 kms south of Nanaimo on Vancouver Island. Originally both Cowichan Lake and the settlement were known as Kaatza, the Cowichan word for "big lake". The Cowichan Bay area and much of the southern Strait of Georgia is the traditional land of the Cowichan First Nations. The name "Cowichan" comes from an Island Halkomelem word meaning "warm country" or "land warmed by the sun". The name Cowichan Bay originated from a large rock formation on the side of Mount Tzuhalem that resembled a frog basking in the sun. In the 1850's, settlement of Cowichan Bay began as a Hudson's Bay Company fort. This Vancouver Island waterfront community was the earliest development north of Victoria with Europeans settling on the secluded Cowichan Bay to farm and trap. 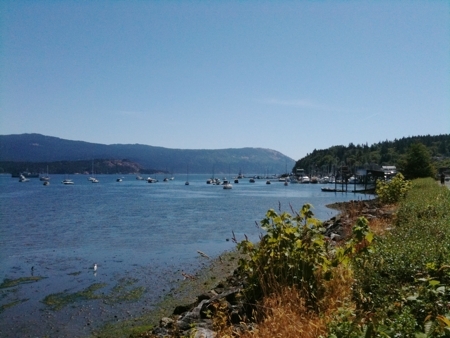 Cowichan Bay is a quaint oceanfront village offering breathtaking ocean and mountain views. This Vancouver Island waterfront community includes a fascinating blend of sail and fishing boats, piers, wharves, floating homes and rural properties. A large portion of the seaside village is built over the water on stilts. In addition to shops and restaurants, Cowichan Bay has a row of unique cottages with some of the homes open to the public as bed & breakfast guest houses. Cowichan Bay has always been known as the place to dine in the Cowichan Valley with great restaurants looking out over the water. The waterfront community of Cowichan Bay is one of the premier sailing and cruising areas in the world and it is home to an active fishing fleet that brings a variety of fish, crab and prawns to her docks. 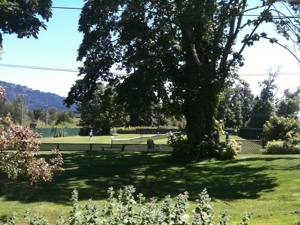 Cowichan Bay is home to the second oldest active lawn tennis court in the world next to Wimbledon.